For those of you who aren’t dog owners and never plan on being one, you might want to skip this post. 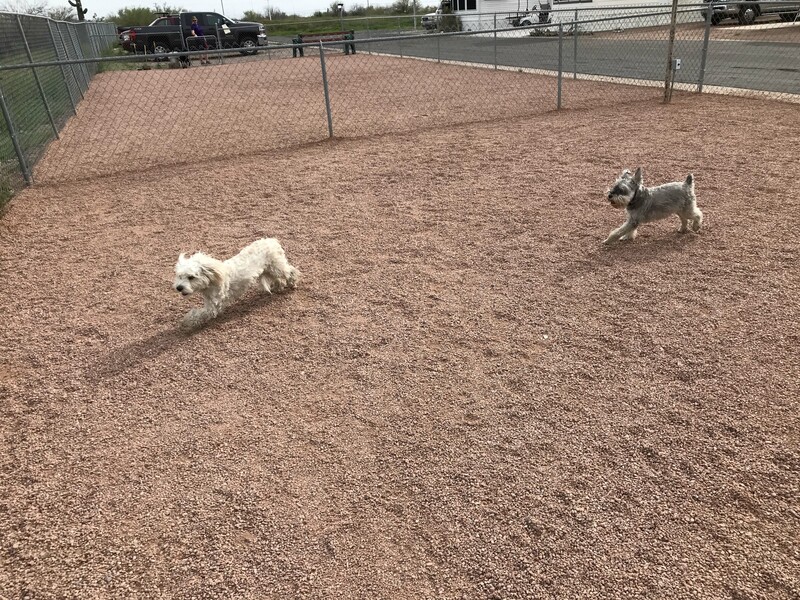 And for those of you who have been going to RV dog parks for years, you will probably think this post doesn’t come close to capturing the experience. 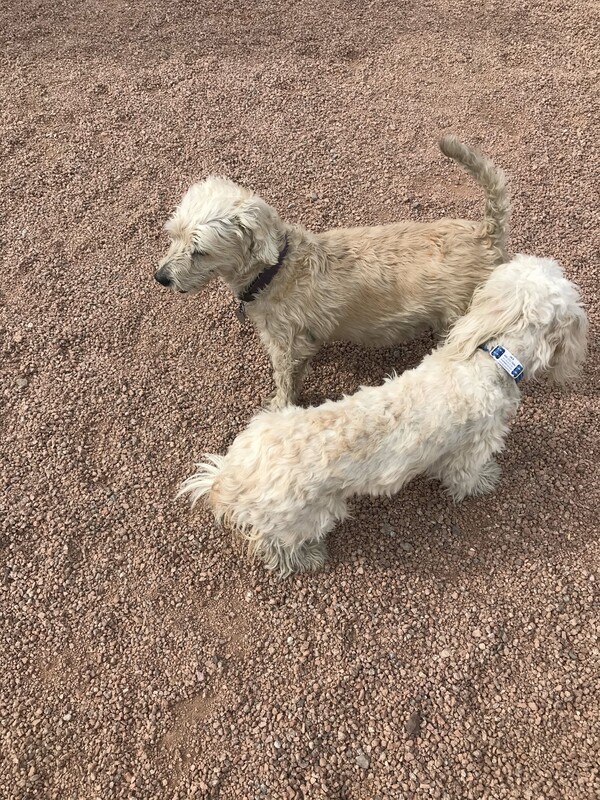 I like to write about new things though and going to a dog park is definitely more complicated than I ever imagined it would be. First of all, if you are a person who stays in more rustic settings, dog parks aren’t a part of your RV life. You get up, take the dog for a walk, and allow him/her to do their business in the most convenient spot. The most important thing is to remember to bring your bag to clean up and you may occasionally meet other dogs while you are walking. Meeting other dogs while walking requires its own bit of etiquette. You might slow down and look at the person and maybe let your dogs sniff each other. Because the dogs are generally leashed (it’s really not cool when one is and the other is not), you have some control over their behavior and how long the interaction is. In general those encounters are fairly brief, with a few courteous words exchanged and then you are back to walking your dog and hopefully getting them to do their business. One of the nice things about this approach is the dog can pick his/her spot. If they prefer concrete, gravel, grass, bare spot, whatever…you can hopefully find a spot nearby that appeals to them. Some dogs like to go in the same place that other dogs go, but some, like Jack, prefer a place where less dogs/animals have been. This is clear from roadside rest areas that are full of dogs smells, because all he will do at this point is smell everything rather than remarking the territory. Hopefully that changes as he gets a little older, because most places have areas that dogs seem to gravitate to. Unfortunately in some RV resorts, all of that goes out the window. Yes, you can walk your dog on the pavement, but there are STRONG taboos against letting your dog pee/poop on someone else’s site. 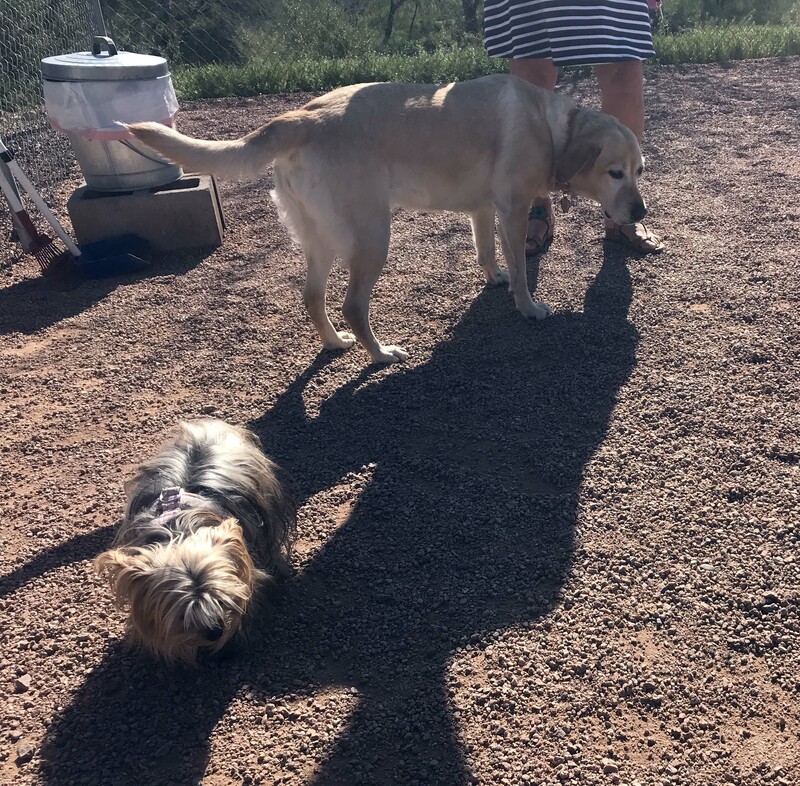 They have dog parks for a reason and unless there are areas on the outer perimeter you can use, the expectation is your dog will be well enough trained to both make it to the park and do it’s business there. Which I have no issue with in theory, but as with many things in life it’s not that simple. 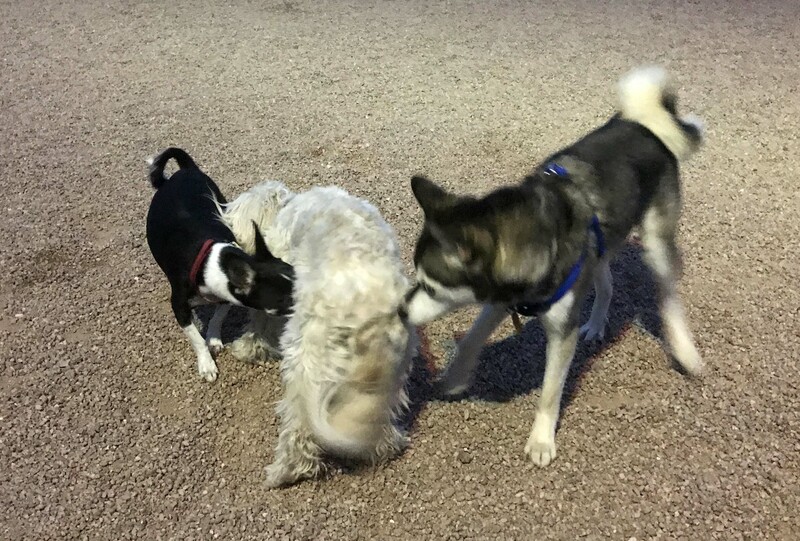 First off, the dog parks have lots of smells, and since so many dogs use them getting Jack to even settle down enough to go has been a challenge. How I envy those owners whose dogs go inside, ignore everything and do their business, but for us right now that is not the case. Jack gets distracted by the smells (which are different every time we go because different dogs) and sounds. If he hears car doors, people talking, people walking by etc he will get distracted and then need to start all over. His routine is to sniff around, start to circle, and finally go. If there are lots of distractions it can take him forever to finish that routine. All of that is of course assuming the dog park is empty. I would say at least 50% of the time it is, but the rest of the time there are other dogs which adds a whole new layer and really is what I wanted to talk about. In this RV park there are two fenced sections to the dog park, so if one half is occupied you can go into the other. Morning and evenings are the most crowded, which makes sense because that’s when most dogs go. I don’t mind evenings as much, because I am awake and dressed, but mornings can be brutal. He needs to go right away in the morning, so it’s pre-shower and in many cases coffee. I am not at my most friendly, and am navigating a social interaction first thing in the morning. And it is an interaction. First we have to walk there, and in this case it is not a short walk. Once there we see which (if any) are open. If there are big dogs in one side, it is a no-brainer for me as I always go to the other side. 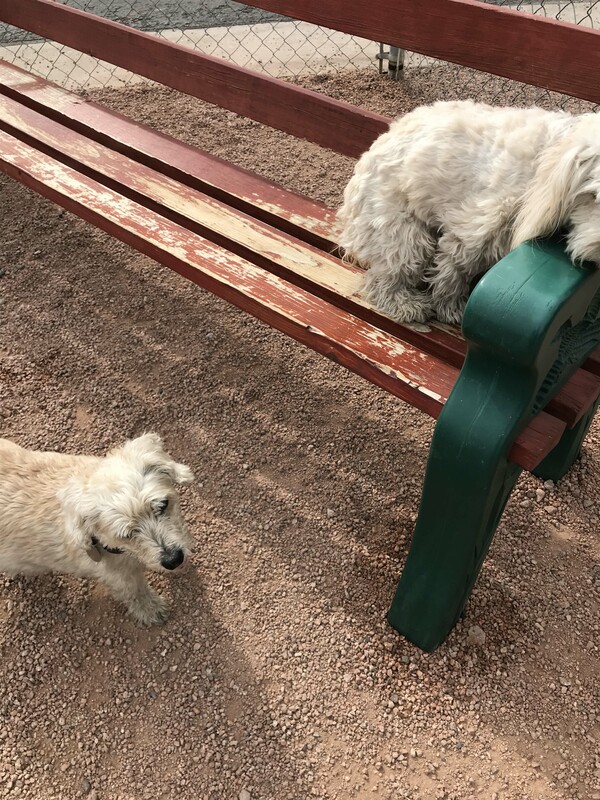 So far Jack is not a fan of big dogs and just sits on the bench until they are gone. Smaller dogs are a possibility, but again it depends. So far he seems to prefer older dogs to younger ones, which is ironic because the older dogs never want to play with him. They tolerate him and he runs around trying to get them to play, but the most we can hope for is a benevolent tolerance. Puppies on the other hand who want to play he is skittish with and mature dogs in their prime he is downright scared of. It’s kind of interesting really, because this is probably what it would be like in a pack, and his “puppiness” is in full force when other dogs are around. None of these factors of course take into account whether or not the owners actually want their dogs with him. I am negotiating with the people while the dogs are checking each other out. We talk about our dogs ages and habits, and apologetically talk about their bad habits. 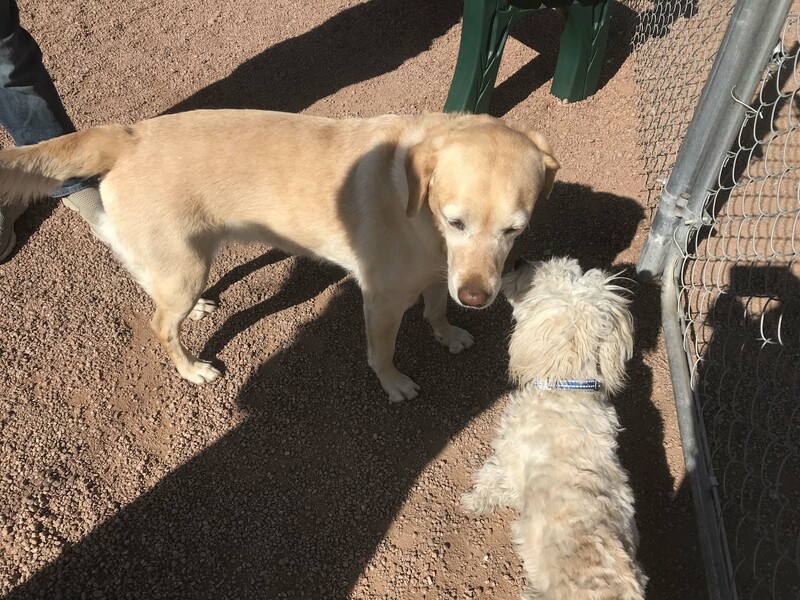 I am quick to say, Jack hasn’t been around many other dogs and the more experienced dog park attendees seem to get that. But their dogs can be aggressive as well, especially when the dogs come in pairs, which is pretty common. While Jack is getting all this sorted out, no way is he going to be vulnerable and pee. He’s uncomfortable, I am uncomfortable, but it’s important that he has the experience. Hopefully over time, being around strange dogs won’t be such a big deal but for right now at least it’s an event every time. Thankfully, the owners usually realize it isn’t working and will take their dogs out as soon as they are done. On rare occasions, Jack seems OK with the other dog and in those cases we will spend more time. I always get excited for him to have both the social and exercise experience, but in these cases I have to make conversation with the other dog owner. Just because dogs get along it doesn’t mean their owners have anything in common, and I have had some bizarre conversations while they play. Because they are going out of their way to help my dog get more comfortable though, it’s important that I am social. Again, not such a big deal in the evening, but morning Tracy in her sweatpants is generally not so friendly. I make the effort though, because as I said the interactions with dogs where Jack is a little comfortable are definitely not the norm. One thing I find interesting is the types of dogs he gravitates towards. I was listening to an NPR podcast recently where they were trying to figure out if dogs could be racist. Turns out that Yale University has a Canine Cognition Center, which has a bunch of different studies trying to figure out if dogs have preferences or prejudices. Their studies are still in the early stages, but I think they will definitely find that dogs do. Jack as I mentioned loves older dogs, which makes sense because Hobie (who is 10) made such a huge impression on him. He treats most of them the same, wagging his tail, getting low, and trying to get them to play. So far his puppy encounters are limited by two dogs, but in both cases he wanted to play with them, but was afraid. The interactions were cautious and much different from how he treated the older dogs. All encounters with grown dogs have not gone well, as I mentioned, except when they are white and fluffy. We met a Scotty the other day and he was all over him. That really surprised me until I remembered the farm he grew up on had Cavachons and Scotties. His behavior made perfect sense then. This was the first pair of dogs we met. 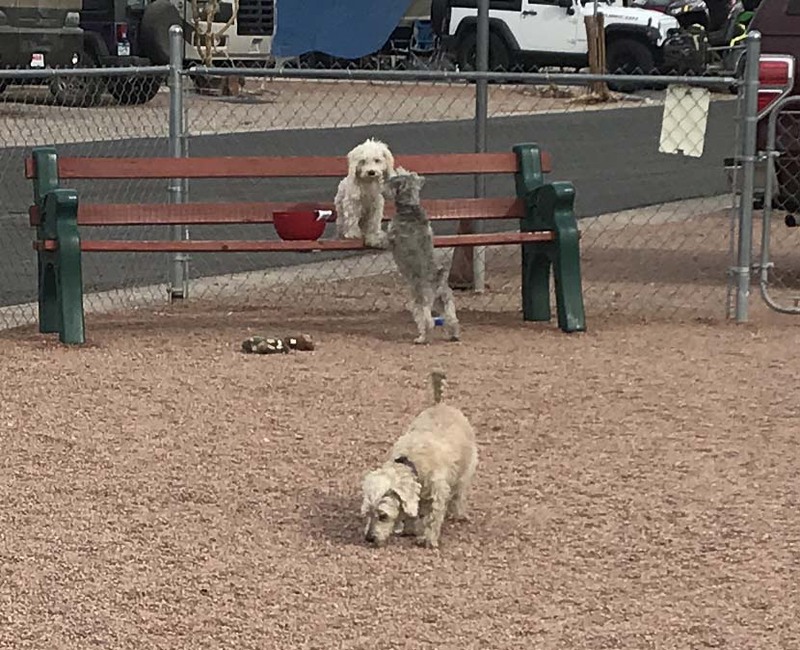 Jack immediately took the high ground and went on the bench. The younger of the pair came to check Jack out but he wasn’t into it. Finally the older of the two dogs came over and although Jack was initially cowering. He finally gained enough courage to jump down and make friends. It was a huge victory on a subsequent visit when he played chase. He was still staying on the bench though with most dogs. He stays close to the owners who have been very cool about it when they find out hes a puppy. Finally we met Cody!! He is a 15 month old . 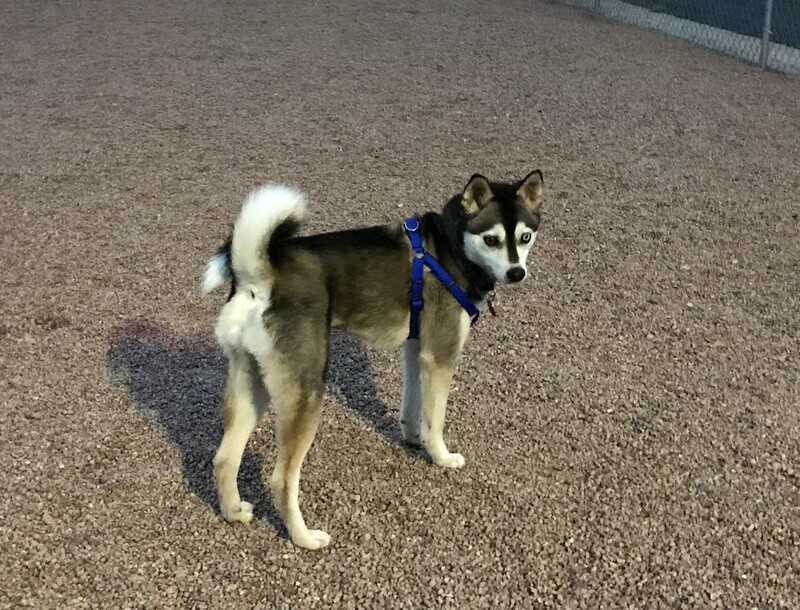 He is an Alaskan Klee Kai and although his father was a full-sized Malamute, he will not be much bigger than Jack. His owner is a super nice guy and been very helpful giving me information about having a puppy in this area. Being overheated and rattlesnake encounters are a real concern and he gave me good advice on both. There was lots of sniffing going on and they always included any third dog who wandered in. They love to run and REALLY fast. As you can see from the picture they are a blur. As comfortable as he got with the smaller dogs Jack wanted nothing to do with the larger ones until he met Heidi who is a support dog for a deaf woman. That dog was so amazingly gentle that even Laci Lou got down and sniffed a little. This dog park has become a big part of my life as we are going 4-5 times a day. Every encounter is different although we are seeing Cody quite a bit. Like I said, not sure it was interesting if you are not a dog owner, but it’s all new to me. I have been a dog owner all of my life, but never been to dog parks. We either had a yard or in the early days of my dog ownership, dog parks weren’t that common. By the end of the week, Jack was much more comfortable with both big and small dogs. There were still a few that he cowered, but mainly he anxiously awaited his trips to the dog parks and was always on the lookout for Cody in particular. The fellow dog owners were also super helpful. Every one of the small dog owners knew him by name and they would take extra time in the park to help socialize him. This helped not only get used to dogs but also strangers as almost everyone wanted to on love on him. The people who had rescued dogs, in particular, were sympathetic, because they had all gone through the process of socializing a dog on the road. I still didn’t enjoy those early morning visits, but the benefit to him has been incalculable. 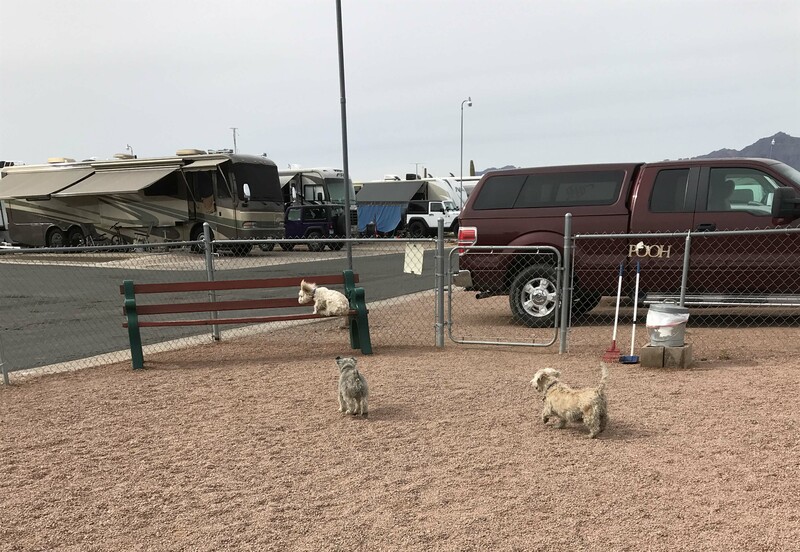 I would absolutely recommend a visit to a larger RV resort with a dog park just for this purpose. It might have taken weeks or months to get to this point if we were only traveling in more remote locations. Instead we both got a crash course in dog parks and came out the other side much better for the experience.